Zephyrhills 100th Anniversary: The Skating Rink - Zephyrhills, Florida 100th Anniversary! The Crystal Springs Roller Skating Rink debuted in September 1939 and was built and opened by Walter T. Curtis, who was born in Texas. His daughter, Bernice Eleanor Curtis Rooks, the ZHS Valedictorian of the class of 1940, was almost five years old when she moved to Zephyrhills with her parents and brother. Mr. Curtis also operated a sawmill and was a skilled carpenter but he had a hankering to build a dance hall in the picturesque location of Crystal Springs near the legendary springs. He eventually decided upon a skating rink. Curtis personally milled all of the rough cut pine which provides the signature look of the vintage Depression-era building that gives one a feel of walking back into a bygone era. Mr. Curtis wanted the skating surface to be just right for his skaters so he imported Tennessee Maple for the tongue and groove flooring that he painstakingly installed. The benches, vintage cash register and walls remain the same today as they did in 1939. With 18 windows and several large fans, who needs air conditioning? Situated on an adjoining area to the Crystal Springs Water Preserve, Curtis leased the Springs area for 10 years and operated a swimming pool next to the rink for some time. His daughter, Bernice, met her future husband, Truman at the swimming pool, and another chapter of the rink’s history began when Truman Rooks took the reins in 1972. Skating was a tradition for the Curtis-Rooks family. Grandpa Curtis configured baby shoe skates for his three granddaughters, Marilyn, Barbara and Joellyn who say they were skating at age three. Truman said he skated himself until age 65. Opening just before World War II, the skating rink is a Tampa Bay area attraction that chronicles many wonderful tales. Imagine the friendships that were created, the romances that blossomed and sometimes flourished, and the refuge from problems of the day that were provided by an afternoon at the skating rink. Army buses of soldiers from MacDill came twice per week during the 1940’s to enjoy the facility. Skating was a national craze; Lou Brooks in the book, Skate Crazy defines the period of 1937-59 as the golden age of roller skating, although roller skating dates back to the 1800’s. 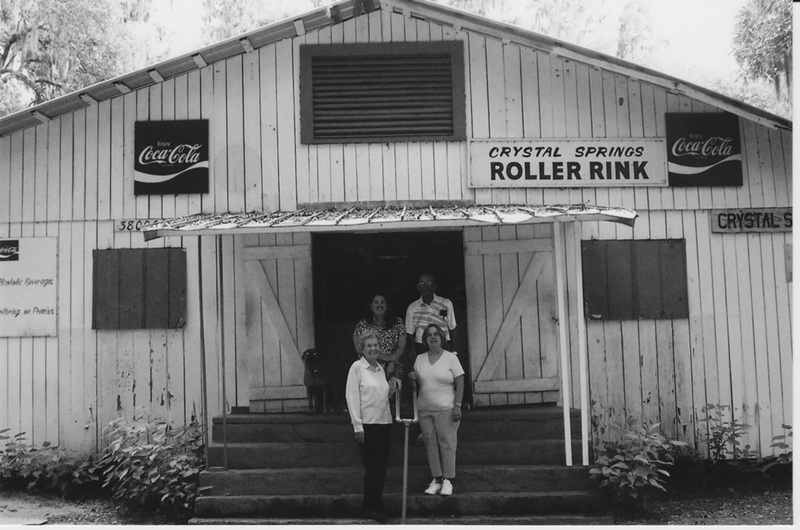 Throughout the years, the Crystal Springs Rink has hosted parties of all types. Once open seven evenings per week, the rink is now open on Friday’s and Saturdays and for private parties. For 35 cents in 1939, you could skate for two hours and today for $4, you can experience the era and get some wonderful exercise. Roller skates have evolved over time! The original skates were clamp-on style and later shoe skates which then morphed into boot skates. Of course today, some skaters prefer the in-line skates, daughter, Joellyn mentioned. Joellyn has been co-managing the family facility since 1984. With three daughters, all remember working at the rink. Barbara shared that slumber parties were quite unique events to host when your family operated the community skating rink. Truman and Bernice Curtis Rooks are terrific role models for the community. Truman has been a firm disciplinarian of the skating facility, setting the rules and managing the crew of kids. His daughters are proud of the many that stop by to say hi to Truman because of their fond memories of times there and his guidance. One particular poignant example was that of an anonymous letter he received with $50, from someone who wanted to make restitution for a childhood prank of stealing some flag decorations; Truman smiles and reflects that this must have been weighing upon his conscience and he just wanted to make it right. Bernice, active in the Zephyrhills community, wanted to fulfill a lifelong ambition to be a teacher. She said her earliest memories were of ‘playing school’ and when she graduated from high school; her mother wrote a personal letter to Eleanor Roosevelt for financial help. (She said they did get a reply from the first lady but no funding). Her father sent her to business school and she worked for awhile until her three daughters were in elementary school, and then took a job as one of only three school bus drivers in the Zephyrhills area; I.A. Krusen was the local school leader and hired her for the job. With her daily contact with the students and often serving as a substitute teacher when the school needed her, she decided to enroll in the brand new University of South Florida (opened in 1958); for $50, a semester, you could take all the courses that you would like. Bernice’s student identification number was 18, meaning she was the 18th person to enroll at USF. Imagine how many students have enrolled since then! Daughters, Barbara and Joellyn, share that they accompanied their mother to classes a few evenings per week and at the time, with only three buildings on the USF Tampa campus, they were fixtures themselves. Bernice finished her degree in 1963 and taught school until her retirement in 1990 at East Zephyrhills, West Zephyrhills and Woodland Elementary Schools. While daughter, Joellyn, carried on the Skating tradition and eldest daughter, Marilyn, works at Verizon, middle daughter Barbara continued the teaching profession and served as a teacher in Zephyrhills for 36 years. The Rooks are proud to have four grandchildren and four great grandchildren! By Madonna Jervis Wise and Clereen Morrill Brunty of the 100th Anniversary Committee, ZHS. Article originally appeared in the Zephyrhills News on July 30, 2009. I have great memories as a child there. In fact, I take my children by there and they can’t believe its a actual skating rink!! lol My father still lives in Crystal Springs! Mrs. Rooks was my kindergarten teacher in 1979 at Woodland Elemantary, and I can remember going on field trips to the roller rink. My mother Mildred Gill would tell me about her and and my aunts and uncles going to the roller rink. Mom sadly passed away this year from a battle with cancer, leukemia, she was the youngest of 8 children of marion gill and lonteen gill/ Johnson. many really great memories of the roller rink. I grew up skating there me and my brothers and sister. We lived hanging out there. Its a sad loss that Mr. Rooks has passed away. Ive been going since I was a child, my family as well. (Betty mchan ^above^ is my aunt) its a great time for sure! Loved growing up at the skating rink on the weekends.. lots of good times.. Mr.Rooks knew every kid by name. Just a Swingin!! Is one of the songs I remember skating to!! I loved going skating on Friday nights- it’s what we lived for after Football season was over!! My mom and dad skated here, as well as my sister and me, and our kids. Mr Rooks was the best he was like family to us, we miss him very much, joellen and Steve are doing a great job though. I will always have great memories…. I grew up going there and Mr. Rooks was a great man and I thought of him as a grandpa to me. He introduced me to my future husband and we have been together for 24 yrs and have 2 kids and we took them there and we still try to find time to go and skate and we are in our 50 & 60 yrs old. My husband and I had our first date here. I loved spending my Friday and Saturday nights roller skating. Made a lot of wonderful memories. And the best classic coca colas in those little glass bottles were amazing after working up a thirst from skating! I remember when we moved to Crystal Springs from the Motor City. I remember being miserable with nothing to do. The springs were open to the public back then. I remember going to the rink every friday and saturday, probably saved me from a lot of trouble. When I grew up and had children of my own I took the kids on weekends and they also loved it as much as i did when I was a child. Now they are all grown up and we moved away but the memories are still with us. Thanks for being there. Hope you have many more years to come. My church group from Dade City had several skating parties here as very young teens in the mid 1950s. Those who could skate helped the rest of us as we learned to stay up and eventually graduated rom the outside edges to the middle of the circling crowd. good times and great memories. I grew up in upstate NY and skated for years at the Sylvan Beach Skating Rink. My cousin Bud (Clyde) Schafer worked there many years. We had more fun and there were plenty of good skaters, esp. my cousin Bud. Me, not so much..but I had fun and it was a chance to meet some local boys..those were the days. I moved to ZHills in 1999 and was very surprised to hear there was a skating rink near by. I did not go skating but was always happy to refer folks there. The old roller skating organ music was special. remember that? ?